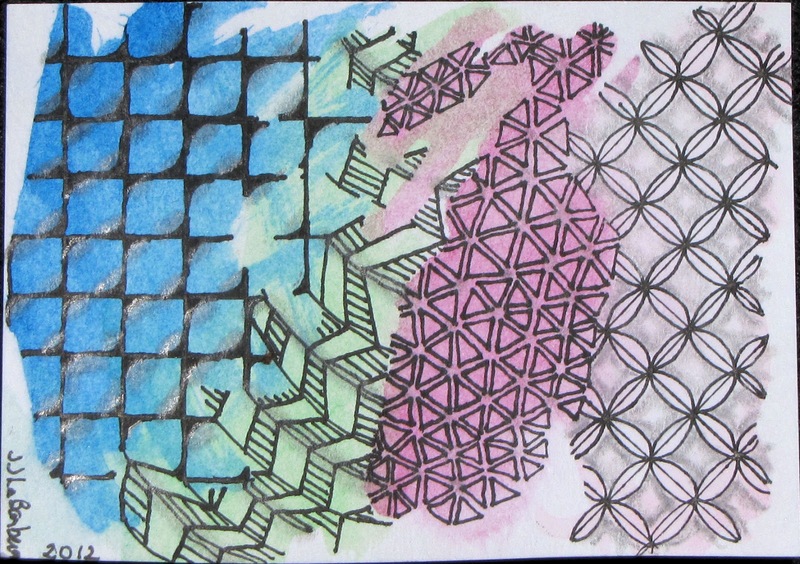 I am still exploring using watercolor with Zentangle. I learn more each time and am finding this a lot of fun. I have tried the standard 3.5" X 3.5" tile, Artist Trading cards, 5X7" and working on a 9X12 page. Each size can present its own challenges and each brings a new experiment to learn. The only constant that I find so far is that everything is different each time. I think that I MIGHT have figured out how much paint is too much though. On a few ATC that I painted over the weekend, I just dropped the watercolor on the wet card and let the paint flow where it may. 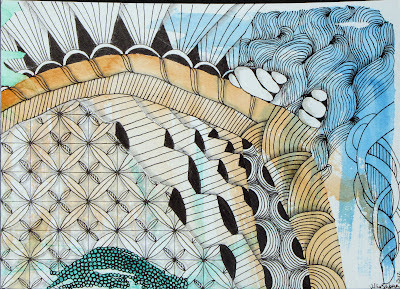 While producing a lovely effect, it left a lot of the watercolor on top of the paper. Too much paint on the paper will disrupt the ink flow from the Micron pen. The end of the pen, picks up the paint causing the ink to stop. Good news is that you can write or wipe it off and the pen works fine again. I think to finish a spot or two I will have to use a Sharpie Pen to finish. 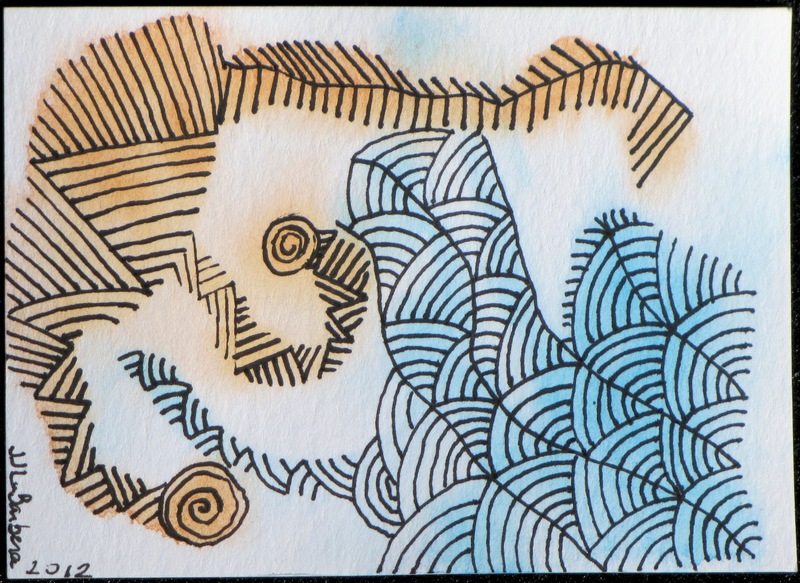 Sometimes there are places on the ATC cards where the ink from the pen bleeds a bit. I am not sure if this is how the ink flows on the watercolor paint, or if that the paper was wet changes how it accepts the ink. The bleeding isn't bad though. The line is a touch thicker and is darker in those spots. My main concern with this however, was that the bleeding would pull the ink from my Micron faster than normal. Then I remembered that I had a few older pens that didn't work as well any longer, they left skips and/or a lighter line, and wondered how they would work on these watercolor places. I am happy to report that they work great! It is almost like having a new pen. Plus I don't worry about those pens losing ink too fast. I had already written them off but was keeping them around because I couldn't bear to part with them. The old pens now have a home in my ATC kit that I am keeping in my purse. 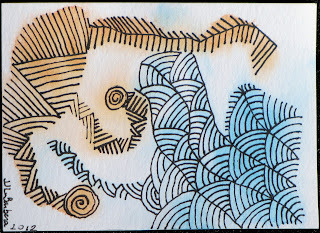 This is the first ATC that I tried with watercolor. Again, I just followed the paint as the string. The pattern on the left is a variation of Atorm. I wanted to let that beautiful blue show through. When I was photographing it, the light caught the pencil shading that I did and gives the photo a shine that isn't in the original. I like these small sizes. This one is done on a Bristol card. I just bought some watercolor paper sizes that I have painted and will try ink on next. 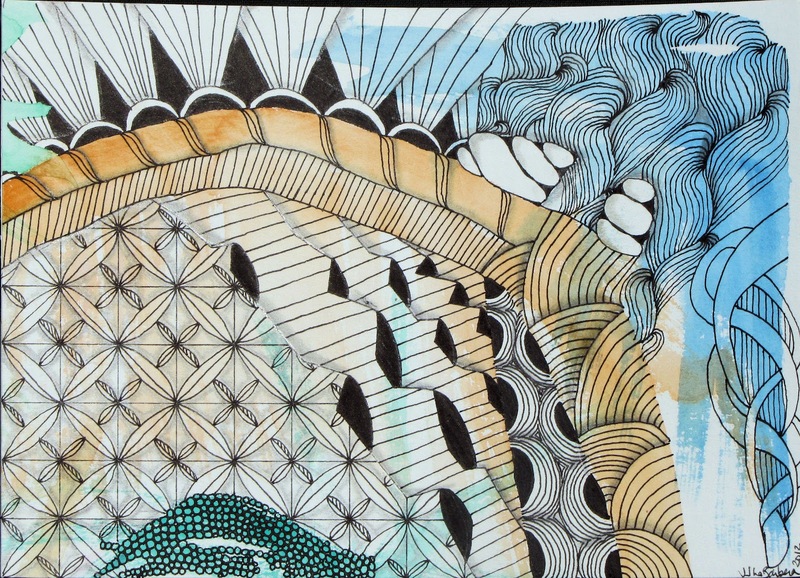 I am interested to see if the ink will flow differently on the water color paper. Aliens was an experiment with less color on a page. After I got all the lines drawn, it looked like some alien life forms. Before I started playing with the ATC size, I started doing a 5X7" size. I liked how it was going and was moving right along on it but then I got to a section and was stuck. I couldn't decide if I wanted to add a tangle or not and if I did add one, I couldn'd decided on what pattern to put there. So, I set it aside and waited for an answer. Last night I was trolling Pinterest for some inspiration and found Braids. I love the flow of this pattern so much. The site is in German though, so if you would like to read the great lesson that Simone Bischoff has posted I would recommend it. So, braids... This morning I flipped back to the 5X7" piece to see what new things, if any, it had to say. I had braids in mind so I thought that I would try it in my trouble spot and see what happened. I am sooo pleased to say, it worked great! The "steps" there are my try at Planateen that went terribly wrong. 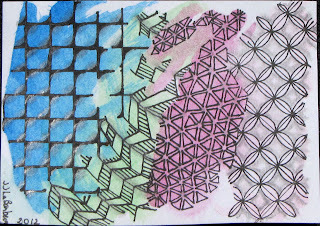 I did it fine on my practice of the pattern, but once I put my pen to the paper, I lost my mind. Luckily, I think that it came out ok despite my best effort to mess it up. In this piece, I still used the color as a string, but wasn't as fussy about it. I also drew on the white paper. Some bits are more successful than others but on the whole, I like it. Thanks to all of you for the great feedback that you have been giving me on this journey into color. It helps so much.